Spring is just around the corner and it’s that time of year when the deep cleaning commences, especially when it comes to your car. There is no better feeling than driving in the warm spring weather after cleaning out your vehicle. But before you head out for a windows-down adventure, consider some necessities you won’t want to find yourself without on the road. If are planning any long drives or road trips this Spring, you will want to be prepared should you get a flat tire or break down far from home. So, consider keeping an extra change of clothes with you. Another trick for being prepared is to pack a picnic basket with some water bottles, utensils, a blanket, and any dry foods that won’t perish. Keeping these items handy is a great and convenient way to ensure that you will not only be ready for a spur of the moment adventure but that you won’t go hungry in case of an emergency. 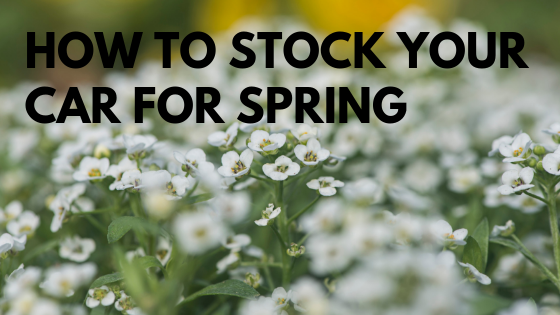 Other important supplies to keep readily available in your care might include products that will help you deal with the bugs that appear in the spring. A can of bug spray is always a good thing to keep in your car as well as some SPF 100 sunscreen. You don’t want to find yourself at the lake on an impromptu outing and become sunburned simply because you were not properly prepared. Because rain showers are also common during spring, having an umbrella in your car can be extremely useful for both predicted and unforeseeable changes in weather. Trade out your ice scraper for an umbrella and stay dry! Another important item you might want to consider for your springtime car carry-ons is a portable battery charger. It can be a terrible, sinking feeling to suddenly realize you left your headlights on and that your battery is dead — particularly with no other cars in sight to give you a jump. Instead of waiting hours for a car service or for someone to drive by, you can pick up a portable battery charger that can get any car started with a dead battery. That’s one investment that always pays off. While you’re at it, you should also pick up a tire pressure gauge if you don’t already have one. Before heading out on a long drive you should check your tires and be sure they have enough air. Not having enough air in the tires will actually lower your gas mileage. Just in case you do get a flat tire, it’s nice to keep a pair of work gloves in the car so you can work with heavy-duty automobile grease without getting your hands dirty when there is nowhere to wash it off. Most people don’t expect to be pulled over or to get in an accident, but it can happen. Keeping your insurance and registration in the same place in an organized fashion will help ensure you won’t lose those important documents. A visor clip or other organizer is a good idea for keeping those important papers organized. It doesn’t hurt to keep some extra oil, windshield wiper fluid, and a few gallons of water in the trunk as well. Sometimes your car might just overheat or need an oil top off. It’s best not to have to purchase these things from gas stations when you’re on the road because some know when customers need oil or other automobile fluids they really need them, and so they charge more for them. An extra auxiliary cable, phone charger, and mp3 player is always a good idea to have as a backup in case your phone dies. If you are taking a road trip, you really don’t want to run out of battery on your smartphone when it is relied so heavily upon for navigation. It’s worth keeping an extra pair of sunglasses and a box of tissues in the center console or glove box too. Woody notes that some other creature comforts are always nice if you have a pet. You might consider keeping an extra box of dog treats in the car, for a start. If you are a pet owner, one of the worst situations is finding yourself without a plastic bag for picking up your dog’s mess. It’s also worth investing in a box of doggy bags and keeping them in the glove box or trunk. In fact, you can pick up an organizer from the store that can be stored in your trunk and keep all the little things like sunscreen and doggy bags organized, so they don’t roll around and make a mess. With these tips, hopefully, you have given some thought into preparing your car for spring and now know what you need to make sure you don’t find yourself stranded or missing something when you are on the road.